IMPORTANT NOTE: There is a FAQ section and a Known Issues section in the readme below (and included with the mod). PLEASE READ BEFORE COMMENTING - particularly if you're having technical issues with the mod. WMK-FOOK2: If you're wondering where to get all the custom weapons seen in the screenshots captioned with 'WMK-FOOK' or 'WMK-FOOK2', grab the WMK-FOOK2 package (FOOK2 required). Q) Why is this weapon doing less damage after I modified it? A) While silencers in WMK are intended to decrease weapon damage slightly, other mod kits should not have an effect on damage. If you see this happen, it means you've installed another mod that affects vanilla weapons, and it's conflicting with WMK. Most commonly, this is FWE, and you'll need to install the WMK-FWE patch available from the FOIP page (link above). If you're using WMK, FWE and RH_Ironsights, you'll need the WMK-FWE-RH_Ironsights patch linked to above. Q) Why won't the game let me modify this unique weapon? 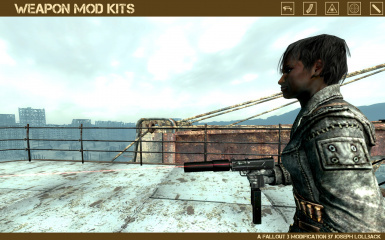 A) If you're using Fallout Wanderer's Edition (FWE) and the WMK-FWE patch, it intentionally removes the ability to modify unique weapons. I am not the author of the WMK-FWE patch, for the record. Q) I've uninstalled WMK-FWE and now I can't access the weapon modification menu at workbenches anymore. What's going on, and how can I fix it? 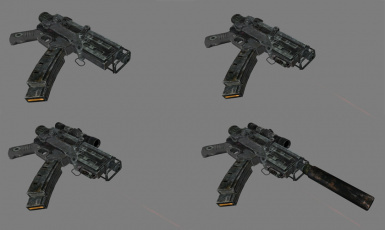 - Auto-Fire Mechanism (AF): Adds full-auto firing capability to most guns that do not have it otherwise (also increases weapon spread by around 50% and reduces weapon to 65% of its default accuracy in VATS). - Extended Magazine/Clip (EC): Doubles magazine/clip capacity. 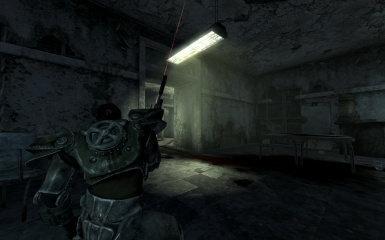 - Laser Sight (LS): Increases accuracy (reduces weapon spread by around 33% and increases weapon accuracy in VATS by 25%). - Scope (SC): Can use scope to sight targets, increases range by 30%. - Silencer (SI): Makes weapon silent, reduces damage and projectile speed (by around 10% each). In addition, the loving attention bestowed upon your weapon during modification results in durability improvements. 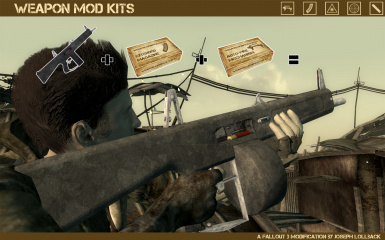 Each successive mod applied to a weapon increases its durability by 25% (of its base durability). 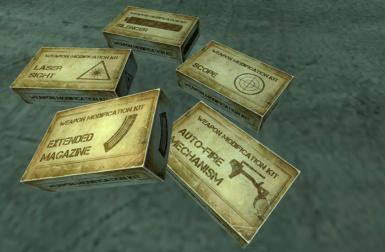 To modify a weapon, take it - plus one or more applicable Weapon Mod Kits - to a standard Workbench. 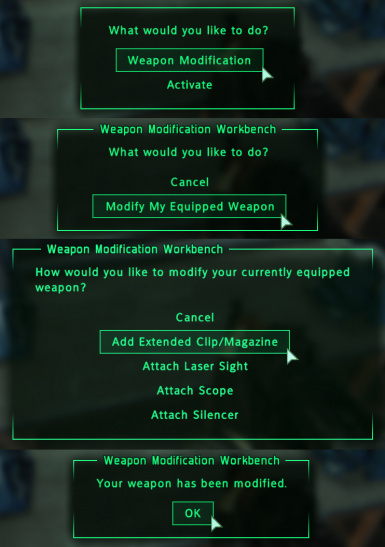 Activate the Workbench and select 'Weapon Modification' from the menu. 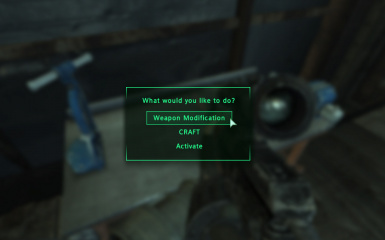 You can then either add modifications to - or remove modifications from - your CURRENTLY EQUIPPED weapon. 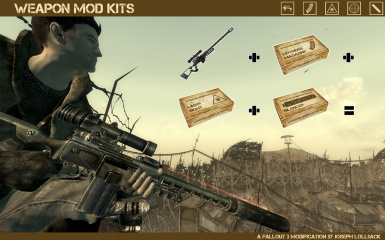 Successfully adding a modification only requires that you are carrying an appropriate Mod Kit. 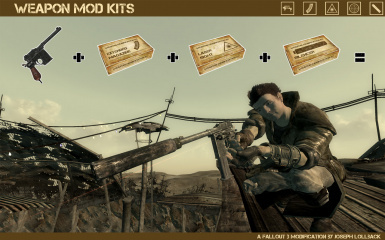 There is a chance when removing a modification, however, that recovering the Mod Kit will fail and the Mod Kit will be destroyed. The higher your Repair skill, the more likely you are to successfully recover Mod Kits. (This is a percentage chance equal to 25 plus three-quarters of your Repair skill). 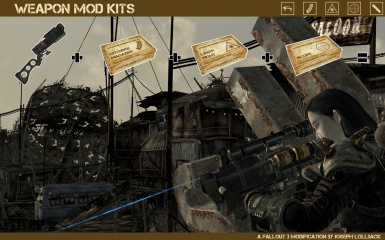 Your Pip-Boy will keep track of the modifications added to a weapon by appending its display name with the appropriate initials for each Mod Kit (as described above). For example, a 10mm Pistol with a laser sight and silencer attached will be listed as '10mm Pistol (LS, SI)'. 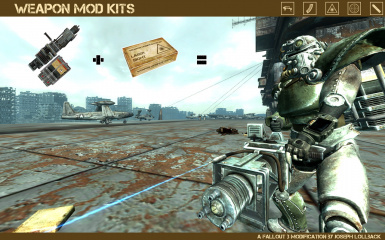 - Different versions of FOSE have different official Fallout 3 patch requirements. Check the FOSE documentation for details. 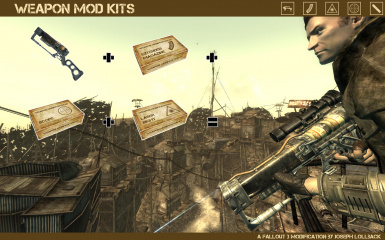 - Using 7-Zip (http://www.7-zip.org), extract the contents (everything - ALL files and folders) of the WeaponModKits.7z archive file to your Fallout 3Data directory. If asked if you want to overwrite files and folders, click 'Yes to all'. 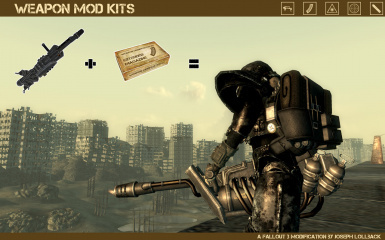 - In the Data Files section of the Fallout 3 Launcher - or using a tool like Fallout 3 Mod Manager - place a tick in the box next to WeaponModKits.esp. - VERY IMPORTANT: Create an automatic merged patch (see below). 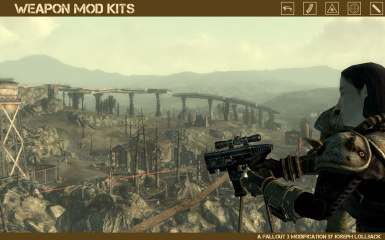 - This is MANDATORY unless you use WMK on its own with no add-ons (such as compatibility patches or add-ons for DLC weapons); and even then it is strongly recommended as standard practice when using mods for FO3, as it may improve compatibility between mods you may be using (including - but not limited to - WMK). 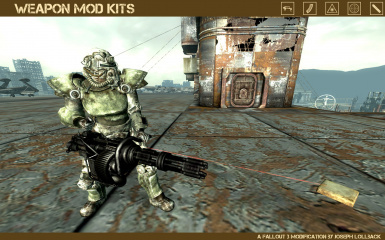 - Run FO3Edit, and a list of all the plugins in your Fallout 3Data directory will come up, listed as per your load order. 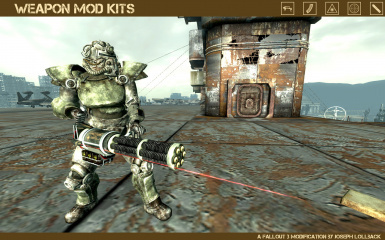 By default, the plugins you have activated in the Fallout 3 Launcher or in FOMM will have ticks next to them. This is what you want, so just click 'OK'. - Once FO3Edit has finished loading, right-click somewhere in the panel on the left that lists your activated plugins, and select 'Create Merged Patch' from the context menu. - Enter a name for the patch into the window that pops up (any name you like), and click on 'OK'. - Once FO3Edit has finished generating the patch (it creates a new .esp file with the name you entered), which should only take a few seconds, close FO3Edit. Click 'OK' on the window that pops up to save the Merged Patch that was generated. 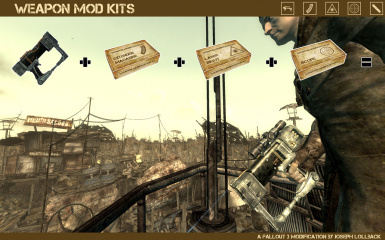 - Finally, make sure the Merged Patch esp is loading after all your other plugins (which it should already be, by default), and activate it using the Fallout 3 Launcher or FOMM. - If you ever uninstall plugins - or install new ones - deactivate and delete the Merged Patch, and then follow these instructions again to create a new one. - (Optional) If you wish to save a small bit of hard drive space, you can delete the mesh and texture files you installed when installing WMK v1.0, since some of those files will no longer be needed. 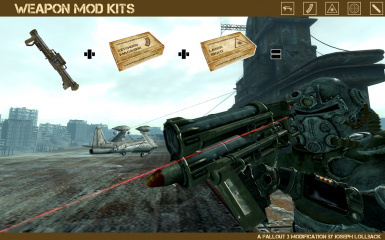 Specifically, delete the Fallout 3DatameshesweaponsWMKweapons folder and contents, and the Fallout 3DataTexturesweaponsWMKweapons folder and contents. - Follow the 'Automatic Merged Patch Creation' instructions above. - Load a previous save-game (or start a new game) and continue playing; no other actions are needed. - Simply follow the installation instructions above, overwriting the files from the earlier version. - Load your save-game and continue playing - no other action is needed, and you won't lose anything. - If you wish to keep any weapons with modifications applied to them, you will need to remove all modifications from those weapons. 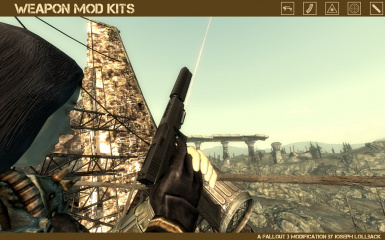 - Save your game and exit Fallout 3. 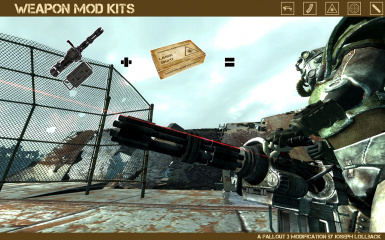 - In the Data Files section of the Fallout 3 Launcher - or using a tool like Fallout 3 Mod Manager - clear the tick in the box next to WeaponModKits.esp. 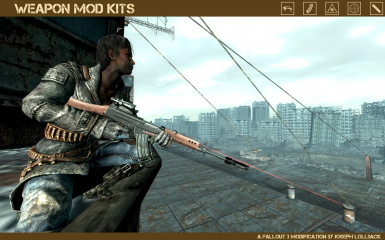 - If desired, delete all files copied to your Fallout 3Data directory during installation (check the WeaponModKits.7z archive file to identify these files). - Load your save-game, and continue playing. 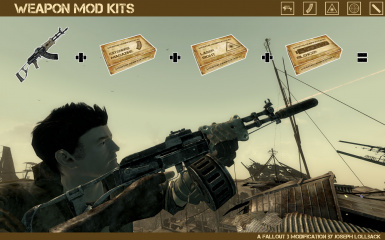 Weapon Mod Kits can be found in the Wasteland - particularly amongst military supplies - but be prepared for an intensive search: they are not common. 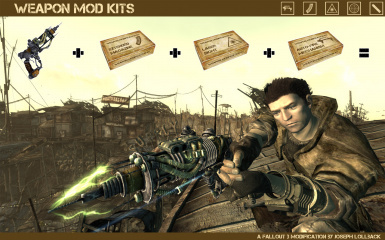 Some Raiders, Talon Company Mercenaries and Regulators are also known to carry Mod Kits - but again, they are rare and highly prized. 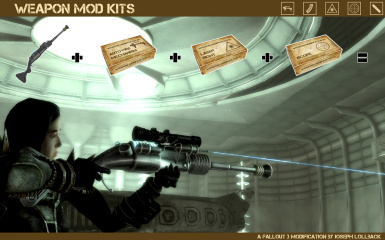 Moira Brown, Flak and Shrapnel, and Lucky Harith carry (and periodically restock) some Mod Kits, but they are not cheap. 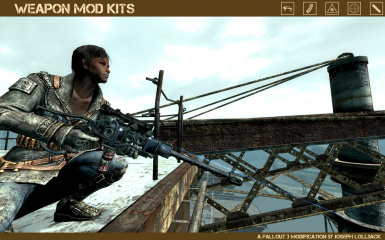 Some Mod Kits may be found lying around in the open as well; particularly in armouries and other weapon caches, and around workbenches in high-population areas. 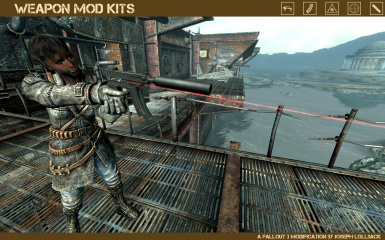 There is a chance that high-level Brotherhood of Steel members (normal and Outcast), Enclave Troops, Raiders, Talon Company Mercenaries and Regulators may be encountered carrying a modified weapon. 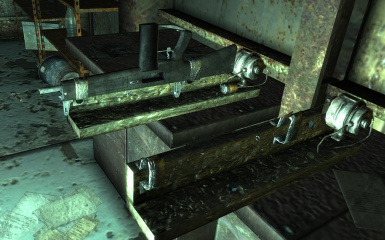 Lever Rifles are non-unique, less powerful versions of Lincoln's Repeater. Some Raiders carry them, and they can be found in some gun cabinets. Flak, Shrapnel and Lucky Harith also sell them. 44 Magnum Revolvers are no longer scoped by default - they need to be modified with a Scope Mod Kit like any other weapon that can have a scope attached. The 'missing' unique weapons Law Dog and Wanda can be modified like other weapons - but you will need another mod that adds these weapons to the game world if you wish to be able to find and use them. Note that WMK does not *require* a mod like this for it to function correctly, however. Q) I'm using more than one add-on for WMK and I can't apply mod kits to some weapons, even though the readme/s say I can. What's going on? A) You need to create an automatic merged patch. Please see the Automatic Merged Patch part of the Installation Instructions section, above. Q) I'm having problems with FOSE/FO3Edit. Can you help? A) If it's not something that's already covered in this readme, then probably not: you would be better off contacting the makers of those programs (I am not affiliated with them). Q) What do I do to stop the 'FOSE Not Detected' message from displaying in-game? 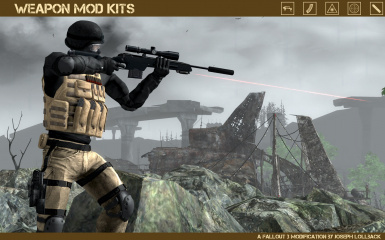 A) You download and install FOSE (http://fose.silverlock.org), and run Fallout 3 via 'fose_loader.exe' or the 'Launch FOSE' button in Fallout Mod Manager (FOMM). 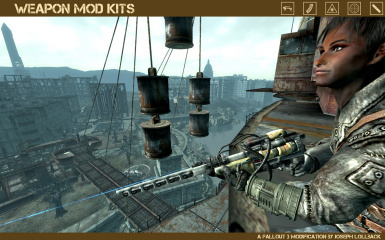 DO NOT run Fallout 3 via the default launcher, or via 'Fallout3.exe'. Q) Why is nothing happening when I try to modify a weapon? A) Ensure you have FOSE installed and that you are running it correctly (read the FOSE documentation carefully). Also ensure that the weapon you want to modify is the one you have currently equipped - and that it is supported by WMK, of course. Q) Can I criticise you for implementing something in WMK in an 'unrealistic' way? A) Well I can't stop you, but I might save you from wasting your time by telling you now that I won't care. 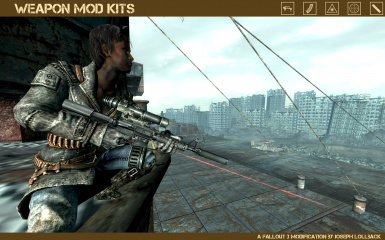 This mod does not attempt to be perfectly 'realistic' - it is intended to make gameplay additions to Fallout 3; no more or less. Q) But you can't silence revolvers! Why have you included silenced revolvers? 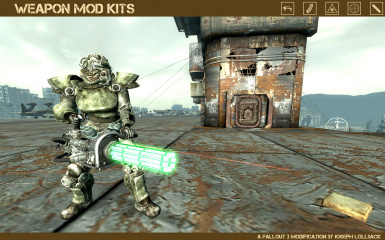 Q) Why can't Miniguns and Gatling Lasers be modified with Extended Magazine Mod Kits? A) This was a planned feature, but the GECK does not allow a clip size larger than 255 rounds, and both Miniguns and Gatling Lasers have a default clip capacity of 240 rounds. 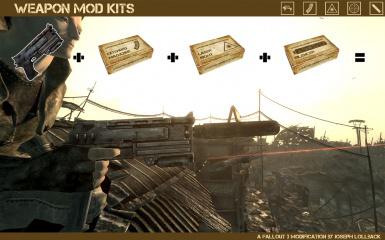 Q) Why are there some (listed) exceptions to which Mod Kits can be applied to some unique weapons? A) 'Col. 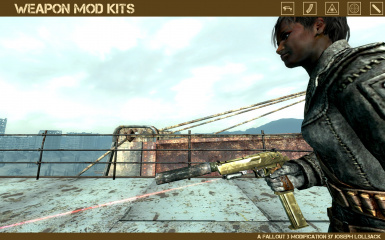 Autumn's Laser Pistol' is fully automatic by default, and so cannot receive an Auto-Fire Mechanism Mod Kit. 'Miss Launcher' projectiles are fired on a limited arc (a bit like a grenade launcher), so a Laser Sight Mod Kit wouldn't be very useful on it. 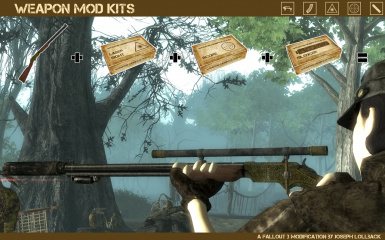 Q) Why are the 'crafted' weapons (such as the Railway Rifle and Dart Gun) not modifiable with Mod Kits? A) For a variety of reasons (that differ from weapon to weapon), they are not well-suited to modification, and will not be implemented. Q) Can I make suggestions for inclusions in WMK? Q) Is WMK compatible with [insert name of mod here]? Q) Is WMK compatible with other mods that alter the standard Workbench? A) WMK does not directly edit the workbench activator or its script, so it should be compatible with all mods that change or add to the workbench (unless the mod in question changes the workbench EditorID or physically replaces them in the game world with another object). WMK is compatible with (but does not require) CRAFT, to give a specific example. 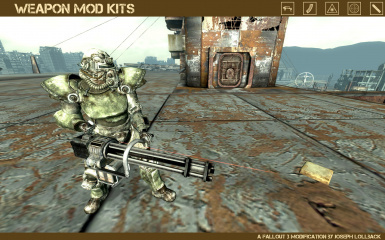 Q) What about mods that change the appearance or stats of the vanilla weapons in Fallout 3? Are they compatible with WMK? 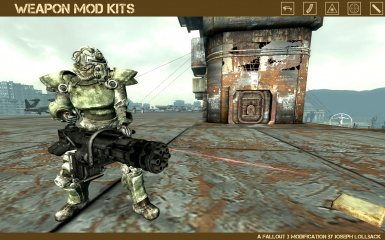 A) I can't give much more info than in the above Q&A point on general compatibility, but some general guidelines: When it comes to appearance-altering mods, WMK should work fine alongside those - but you'll likely notice that the modified weapons will look like the vanilla Fallout 3 weapons (only with the relevant attachments/modifications, of course). 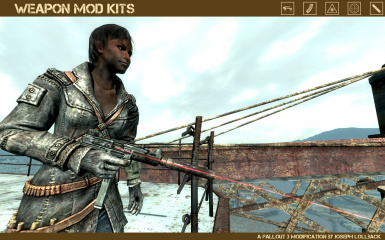 Mods that retexture the existing weapons should work just fine though, for the most part. As for mods that change weapon stats; if they do this by directly editing the base weapon objects then it should work fine alongside WMK (as long as they don't change the ObjectIDs), but again the modified weapons will not mirror those changes. Q) Will you make WMK compatible with [insert name of mod here]? A) Unfortunately I can't start making changes to WMK to make it compatible with other mods that were developed (and may continue to be developed) independently of WMK. Once I started doing that, when would I stop? 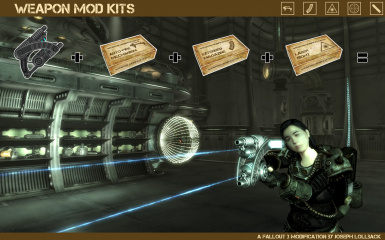 There are just too many mods - and too many combinations of different mods - for this to be possible. This doesn't mean that I won't *ever* do this for a mod, but it is very unlikely. Q) Do I need a compatibility patch for WMK and Mart's Mutant Mod (MMM)? A) No; WMK and MMM do not conflict and so do not need a compatibility patch. Q) Will you make a version of WMK that doesn't require FOSE? A) No; FOSE is now an integral requirement for WMK. Version 1.0 of the mod (which doesn't require FOSE) is still available - but it lacks many of the fixes and features of the up-to-date versions of WMK. Q) What do I do with the file I downloaded? It's an unknown file type/I don't know what to do with 7z files. A) You need a program like 7-zip (http://www.7-zip.org) or WinRAR (http://www.rarlab.com) to open the file you downloaded. After you have that, follow the installation instructions above. 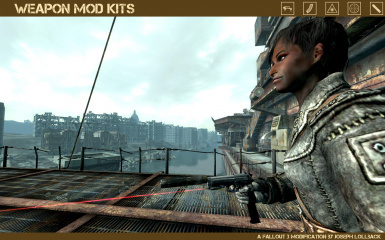 Q) I have just installed FOSE, and now when I run Fallout 3, all my save-games are gone! How do I get them back? 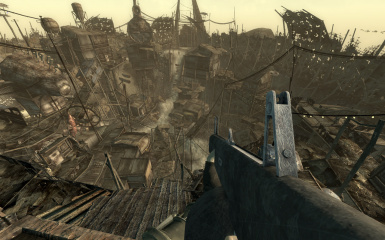 Q) I have just installed FOSE, and now when I run Fallout 3, the official DLC (such as Operation Anchorage) doesn't work. How can I fix this? Q) How do I install FO3Edit? Q) Why am I seeing 3D exclamation points and/or missing texture notifications instead of items from the WMK mod? A) This happens when the game can't find the meshes and textures it's looking for; in this case that means that WMK wasn't installed correctly. 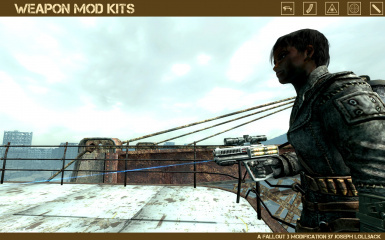 Along with the WeaponModKits.esp file, you also need to place the [meshes], [textures] and [sound] directories from the WeaponModKits.7z archive file into your Fallout 3Data directory. Click on 'Yes To All' if a window pops up asking you if you want to replace files and folders (you won't lose anything). Q) Why are the textures for objects included in the mod not displaying properly or at all? A) Please follow the 'ArchiveInvalidation' part of the installation instructions above. 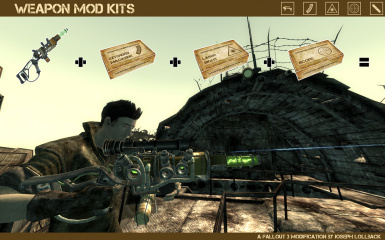 This is required for a wide range of Fallout 3 mods, and only needs to be performed once. Q) Is creating an automatic merged patch with FO3Edit really necessary? A) If you're at all unsure whether or not it's needed, then just do it: not using a merged patch can cause problems with certain combinations of mods, whereas using one will not cause problems. If you're using more than one add-on for WMK then yes, it is necessary. Q) Oh [deity/other exclamation], why have you made this mod so difficult to install? 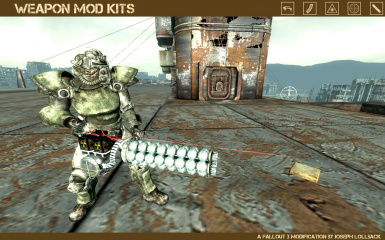 A) Unfortunately the complexity of using mods with Fallout 3 isn't up to me - funnily enough. 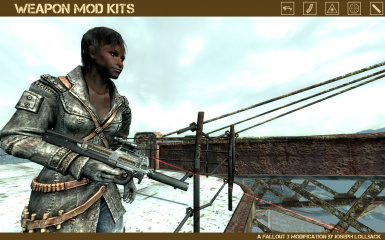 The 'extra' steps involved in installing WMK (such as FOSE, ArchiveInvalidation, and Automatic Merged Patch creation) are required for a range of Fallout 3 mods. 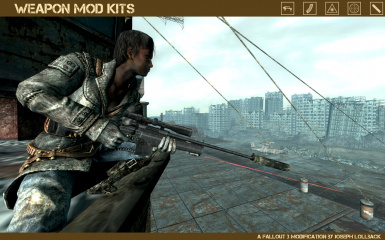 If you plan to use a number of Fallout 3 mods, then sooner or later you'll find yourself needing to perform these 'extra' steps anyway. In any case, following the installation instructions above carefully should guide you through the process easily enough. If you have problems, you can contact me via e-mail or a comment left on the page where you downloaded WMK (FO3Nexus or Planet Fallout). Q) Holy crap! [Insert weapon here] is doing eleventy-billion damage after I apply an Auto-Fire Kit to it. What's happening? A) The weapon is not actually doing that much damage: this is a visual 'bug' in the Pip-Boy display. See the Known Issues section below for more information. 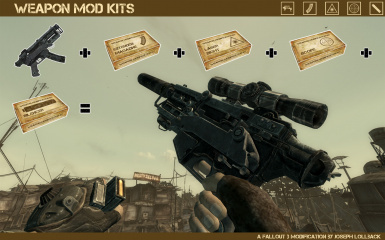 Q) Will you tell me how to cheat to get the Mod Kits so I don't have to go looking for them? A) There are console commands to give your character any items you want; and with a bit of research I'm sure you'll work it out. I'm not going to actively help people to cheat at my mod though: it goes against the intended design of WMK. Without some challenge in finding the Mod Kits, WMK wouldn't be much more than a mod that simply adds some new/tweaked weapons. Q) Why does my save-game crash when I try to load it, after uninstalling WMK? A) This happens if WMK's in-game uninstall script was not run prior to uninstalling the mod. Be sure to follow the uninstallation instructions above closely. - Activating or de-activating this mod should not have any negative effects on your existing save game/s (provided the instructions in this readme are followed) - but as always, it is good practice to keep backups. 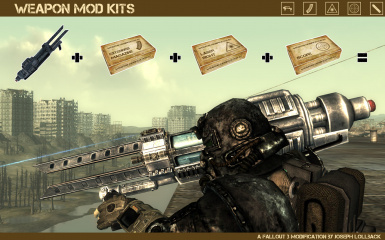 - Follow the Uninstallation instructions above if you wish to de-activate this mod. Trust me. This is important. 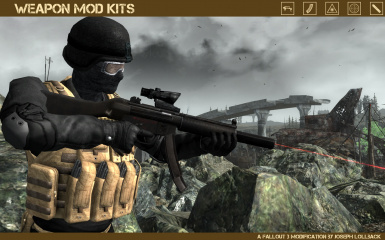 - This mod will likely conflict with - or make redundant - mods that remove or add things like scopes and silencers in special case scenarios (such as removing the scope from the 44 Magnum, or adding a silencer to a unique version of a weapon). 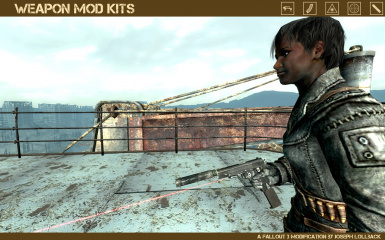 - Due to the way Fallout 3 calculates the *display* in the Pip-Boy of damage dealt by a weapon, some modified weapons may appear to do drastically more damage than their unmodified counterparts. WMK does not change the 'damage' or 'critical damage' stats for any weapons, bar the silenced variants (it was slightly reduced for these weapons, as noted in the mod description). Don't be concerned if you see very high damage numbers in the Pip-Boy (particularly for weapons modified with auto-fire mechanisms) - it is only a visual 'bug'. To be really specific, the Pip-Boy displays damage per shot for non-automatic weapons, and damage per second for automatic weapons (as I understand it, at least - this is all calculated behind the scenes, and is influenced by a number of factors). So if a weapon is modified to fire in full-auto, the way its damage display is calculated is changed. - There is a bug in the GECK that prevents the selection of the correct reload animation for the Combat Shotgun if it has been altered to fire in full-auto. Due to this issue there is a purely visual bug when reloading Combat Shotguns that have been modified with an Auto-Fire Mechanism Mod Kit. 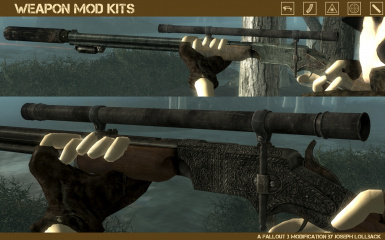 The optional 'WMK AA-12 Combat Shotgun replacer' download largely resolves this problem, and is highly recommended. 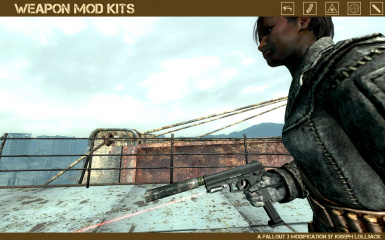 - For similar reasons to the above point, there is also a visual anomaly with the reload animation for Laser Rifles that have been modified with an Auto-Fire Mechanism Mod Kit and/or a Laser Sight Mod Kit. - The laser sights on weapons do not create a laser dot in the world that you can aim with, and the laser beam effect does not point at the crosshair. This cannot really be helped: the beam is set to be parallel to the barrel of the weapon it is attached to, but the animations used in first person prevent the beam from pointing at the crosshair. 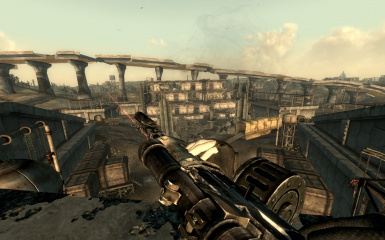 If I ever discover a way to create a laser dot in the world where the player is aiming, I will do it - but at the moment, it is not known how to do something like this in Fallout 3. - The laser sight on Missile Launchers and Lever Rifles/Lincoln's Repeater currently doesn't switch off when the weapon is holstered. This is being investigated. - Modified weapons cannot be sacrificed to repair other weapons (except perhaps for another weapon that has been modified the exact same way). 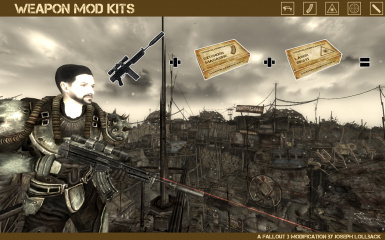 This is partially to avoid conflicts with other mods, and partially to avoid the player accidentally destroying a precious modified weapon to partially fix another weapon. - Following the 'Automatic Merged Patch Creation' part of the installation instructions (see above) will minimise conflicts between WMK and other mods that also alter these base objects. - Huge thanks and credit goes to digicjm for contributing a more efficient back-end to the mod. 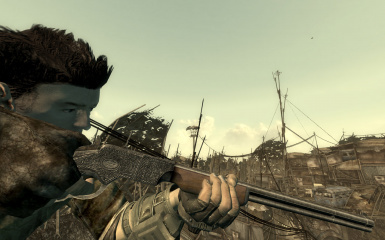 - Credit goes to banjo for his Classic Lever Rifle. 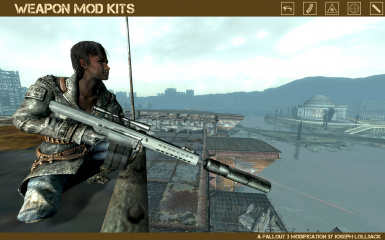 - Credit goes to Bethesda Softworks for the assorted weapon models I chopped and changed for this mod. - Credit goes to Honnou for some sounds from his/her Realistic Gunshot Sounds resource. - Credit goes to joefoxx for his Scoped Hunting Rifle. - Credit goes to Madcat221 for his/her tweaked ('Awesomefied') Plasma Rifle model. - Credit goes to Nopheros for his/her Laser Pointer beam effect. 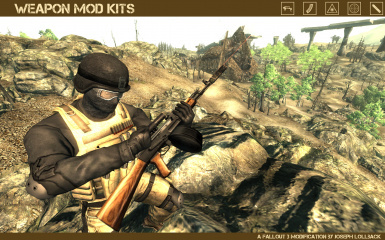 - Thanks go to Bek and Luchaire for their invaluable suggestions and help beta-testing the mod. - Thanks go to ElminsterEU for pointing out how to 'use' the standard Workbenches without directly editing them. 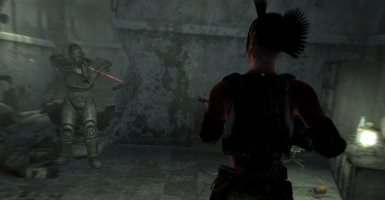 - Thanks go to Madcat221 for pointing out how to improve the behaviour of the Laser Sight beam effect, providing mesh and material fixes for the Scoped Hunting Rifle, pointing out the mesh fixes for the Laser Pistol and Laser Rifle in the Unofficial FO3 patch, and for some technical advice on exporting models (and other topics). 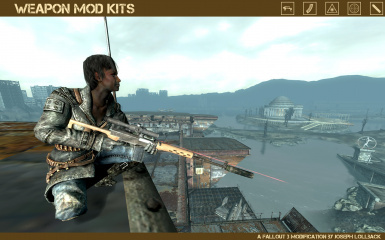 - With the exception of the assets made by the specific authors noted in the Credits section above (see them and/or their mod readme files for permissions in those cases), the weapon models used in this mod are based on Bethesda-made models - and are free to use in other Fallout 3 mods without asking my permission. 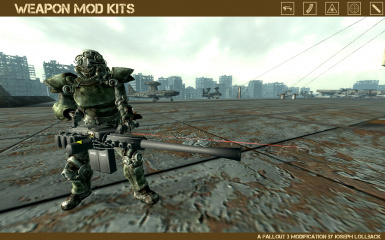 - Please ask my permission before releasing mods that alter or are based on the Weapon Mod Kits mod. By downloading and using this modification, you agree that the author of the modification cannot be held responsible for any damage to software or hardware directly or indirectly caused by the aforementioned modification. Use at your own risk, basically. - Removed several dirty refs accidentally added in Version 1.1.8. This is the only change, so compatibility patches for WMK v1.1.8 are also compatible with WMK v1.1.9. - New scope model for Lever Rifle and Lincoln's Repeater. 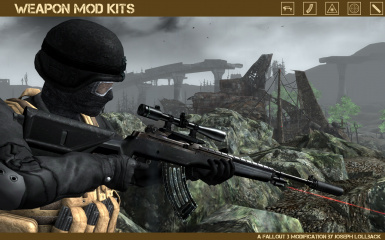 - Increased chances that NPCs will carry Mod Kits and modified weapons. - Decreased rate of fire for the Auto-Fire variants of the following weapons (and their unique variants): 10mm Pistol, Chinese Pistol, Alien Blaster, Plasma Pistol, Laser Rifle, Plasma Rifle. - When attempting to modify a weapon that is not supported by WMK, the player now receives a message specifically saying their equipped weapon cannot be modified. - Added modified Zhu-Rong variants to 'ExplodesGasTrapsOnHit' formlist. 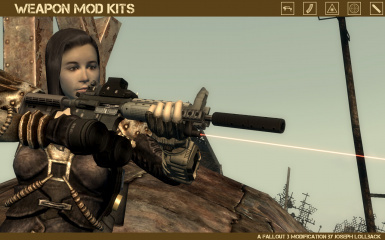 - For modders only: Weapons that should specifically not be modifiable can be added to the new 'WMKProscribedWeaponList' formlist. (Only useful to stop already implemented weapons from being modified, for whatever reason.) Users must be advised to use an automatic merged patch if this is done. - Added a check to see if the player has FOSE running. If not, a message displays every ten seconds telling the player that WMK will not function without it. - Minor tweaks to Plasma Rifle mesh. - Changed how the leveled lists that give modified weapons to NPCs are organised (tidier now). NPCs with modified weapons should be encountered more often now as well (still only at higher levels, though). - Fixed Wanda variants to have correct clip size (30 or 60, rather than 24 or 48). - Miss Launcher (EC) now has the correct firing sound (rather than the standard Missile Launcher firing sound as before). - Minor fix to ProjectileNode location in the Laser Rifle nif file. - Reduced gunshot sound volume for silenced assault rifles. 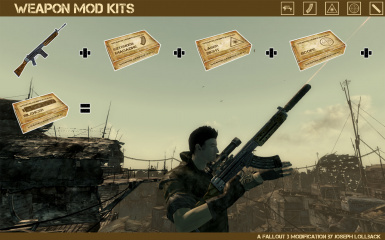 - Increased the chance that a Mod Kit will be carried by a relevant NPC to 3% (from 2%). - Previously (as it turns out), Laser Sights and Auto-Fire Mechanisms only affected the minimum spread *achievable* by a weapon. Now they also affect the spread of a weapon directly. - Weapons can now be modified at standard workbenches (the player is given the choice to modify weapons or use the workbench normally). This was done without directly editing the workbench activator or its script, so it should be compatible with all mods that change or add to the workbench (unless the mod in question changes the workbench EditorID or physically replaces them in the game world with another object). - The custom WMK workbenches were removed, as they are no longer needed. - Removed all changes made to cells to facilitate the custom WMK workbenches. - Moved hand-placed Mod Kits that were found on custom WMK workbenches to somewhere very near where they were found previously. Did not remove any of them. - Mesh fixes for the Laser Pistol and Laser Rifle. 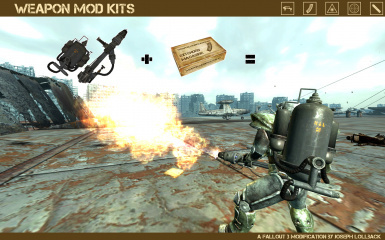 - Modified versions of weapons that do fire damage are now affected by the Pyromaniac perk. - The relevant modified weapons should now ignite gas traps as their unmodified versions do. - Modified versions of weapons that do fire damage can now be used in the... 'fire-based solution' to a particular side-quest. - Updated note summarising the mod to reflect change from using WMK workbenches to standard workbenches. 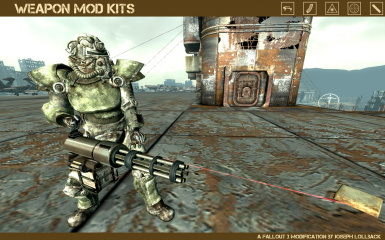 - Added chance that high level Enclave Troops will carry a modified weapon. - Removed testing containers that weren't intended to be included in v1.1 release. 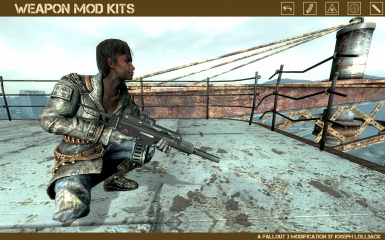 - Added chance that high level Brotherhood of Steel members (normal and Outcast) will carry a modified weapon. - Projectiles fired from silenced weapons now travel 10% slower than projectiles fired from a non-silenced weapon. 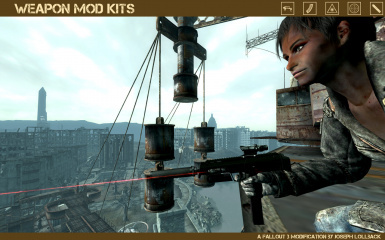 - Added in-game 'uninstall' script to make preparing the mod for uninstallation easier. - Lever Rifles/Lincoln's Repeater can now accept scopes. - Reload animation on auto-fire combat shotgun improved (but still a bit of a nasty hack). - Added dedicated silenced gunshot sounds for rifles and automatic rifles respectively (they no longer use the silenced 10mm sound). 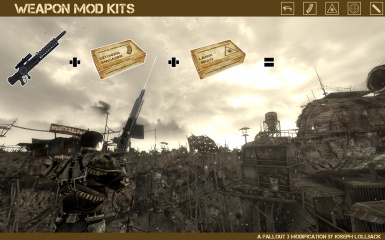 - Reduced chance of finding a Mod Kit in 'military' loot containers. - Weapons with laser sights are now more accurate in VATS, and weapons with auto-fire mechanisms added are now less accurate in VATS. - Material fix for lens on scoped Assault Rifles and Chinese Assault Rifles. - Modified 10mm SMGs are now wielded in two hands (unmodified 10mm SMG remains unchanged). - Disabled part of WMK that allowed unmodified weapons to be repaired with modified weapons (didn't seem to work anyway, and is probably more user-friendly this way). - Items are now correctly added to merchants' inventories again (was broken going from v1.0 to v.1.0.1). - Scopes can now be applied to the unique 10mm SMG again (accidentally left out of v1.0.1). - WMK now requires FOSE v1 or above. 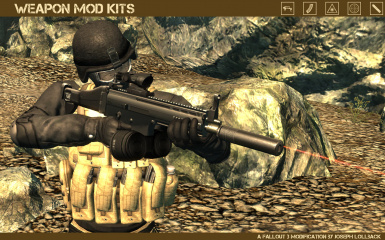 - WMK workbench menu simplified: it now modifies the player's currently equipped weapon. - Laser sights now switch off when weapon is holstered (except for the Lever Rifle/Lincoln's Repeater). - Mesh and material fixes for scoped variants of Hunting Rifles, Assault Rifles and Chinese Assault Rifles. 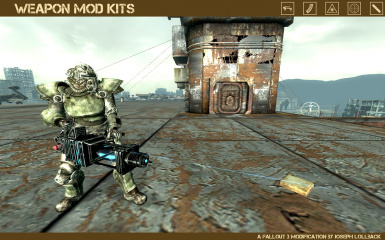 - Modified weapons can now be used to repair other modified or unmodified weapons. - Weapon condition is no longer affected by the character's Repair skill when modifying weapons. 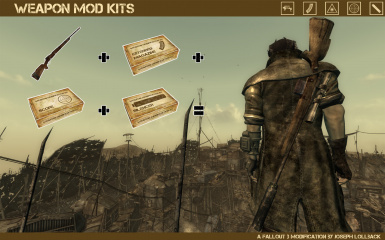 - Changed Mod Kit recovery chance formula to percentage chance equal to 25 + (repair skill * 0.75). Changed from 50 + (repair skill / 2). - More Weapon Mod Workbench menu refinements. 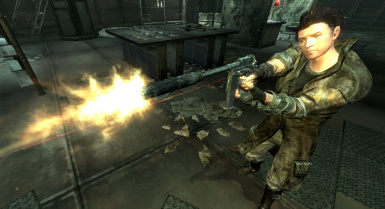 - Added chance that high level Raiders, Talon Mercs and Regulators will carry a modified weapon. - Further refined Weapon Mod Workbench menu. 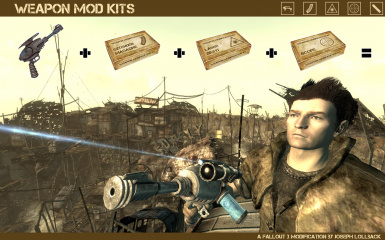 - Changed Mod Kit recovery chance formula to be less brutal. 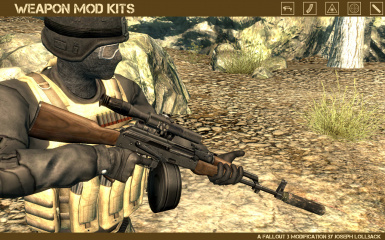 - Reduced chance that Mod Kits will be carried by Raiders, Talon Mercs and Regulators. 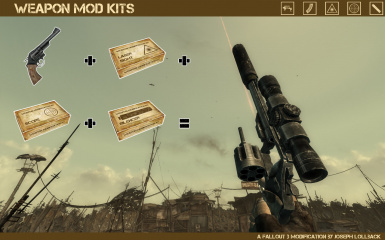 - There is now a chance (based on PC's Repair skill) that recovering Mod Kits from modified weapons will fail and the Mod Kit will be destroyed. 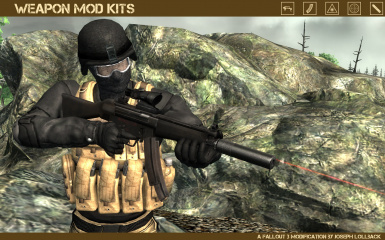 - Auto-Fire modified weapons now have increased weapon spread. - Refined Weapon Mod Workbench menu slightly. - Initial implementation of features.